On Oct. 7, 1913, Ford engineers -- inspired by slaughterhouses in Chicago and Cincinnati -- rigged up a rope tow to pull Model T chassis across the floor of a factory in Highland Park, Mich., to speed assembly of the car. 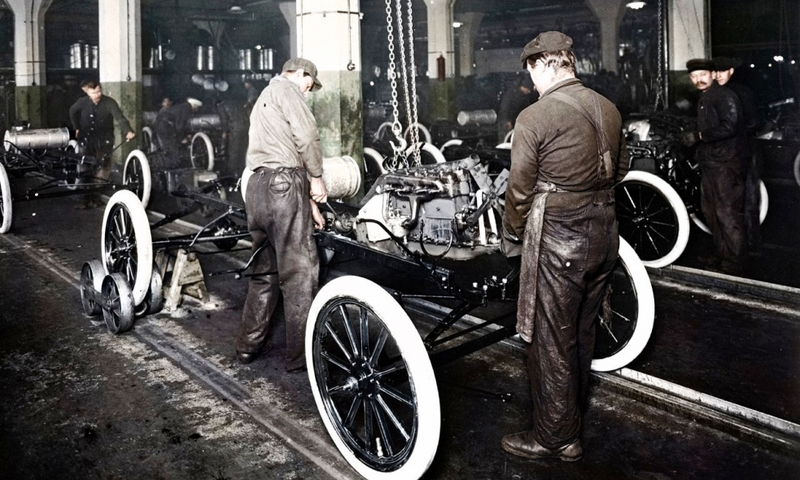 The first moving assembly line -- engineered by Ford at a plant in Highland Park, Mich. -- simplified production of the Ford Model T's 3,000 parts by breaking it into 84 distinct steps performed by groups of workers as a rope pulled the vehicle chassis down the line. 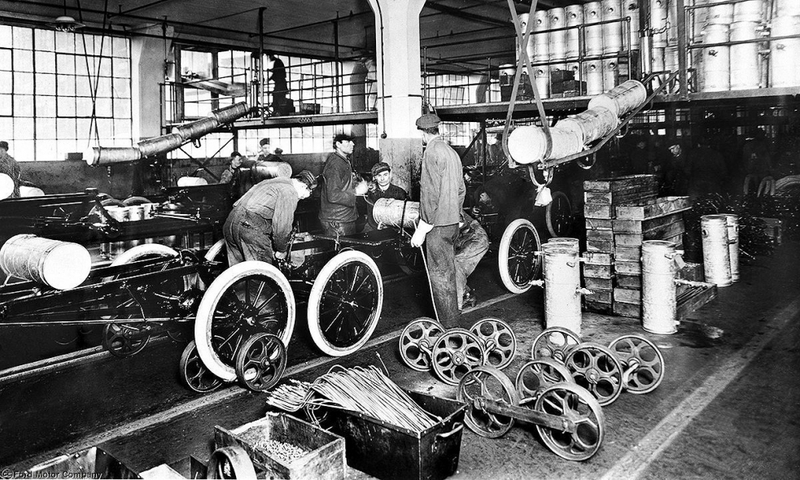 On Oct. 7, 1913, Ford manufacturing engineers rigged a rudimentary final assembly line at the Highland Park Assembly plant. It was a crude system along an open space at the plant, complete with a winch and a rope stretched across the floor. On that day, 140 assemblers were stationed along a 150-foot line and they installed parts on the chassis as it was dragged across the floor by the winch. Under the new process, man hours of final assembly dropped from more than 12 hours under the stationary assembly system to fewer than three. In January 1914, the rope was replaced by an endless chain. By 1916, Model T production had risen to 585,388, and the price had dropped to $360. 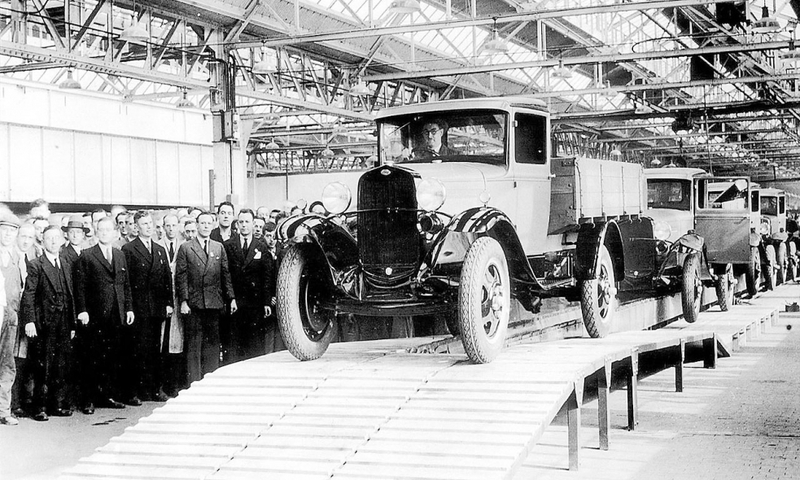 The first Model AA truck rolled off of the production line at Ford's Dagenham plant in England in 1931. 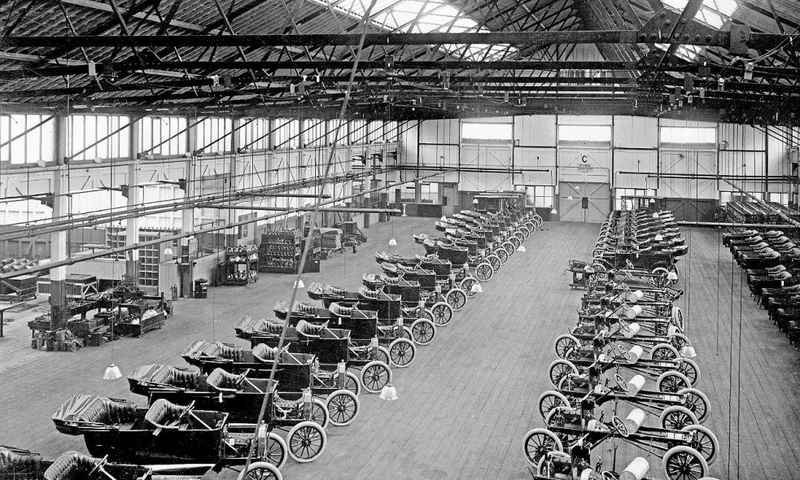 Model T assembly at Trafford park in England. Ford eventually built a Model T every 24 seconds and sold more than 15 million worldwide by 1927, accounting for half of all automobiles then sold. 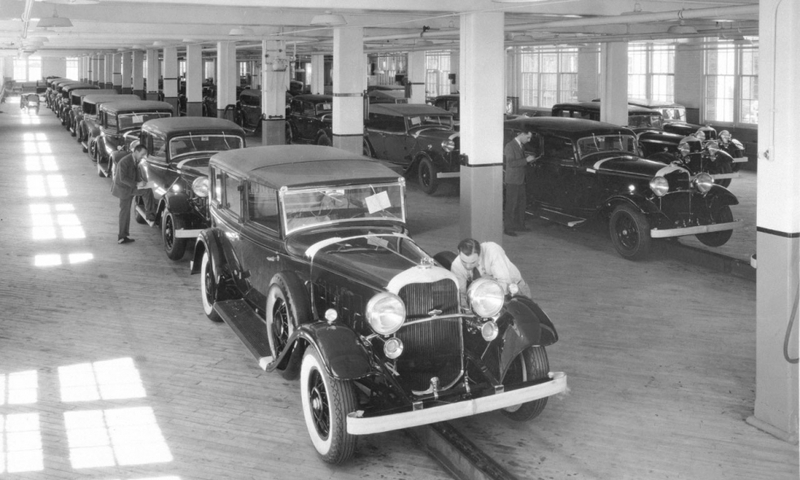 A Lincoln plant in 1932. 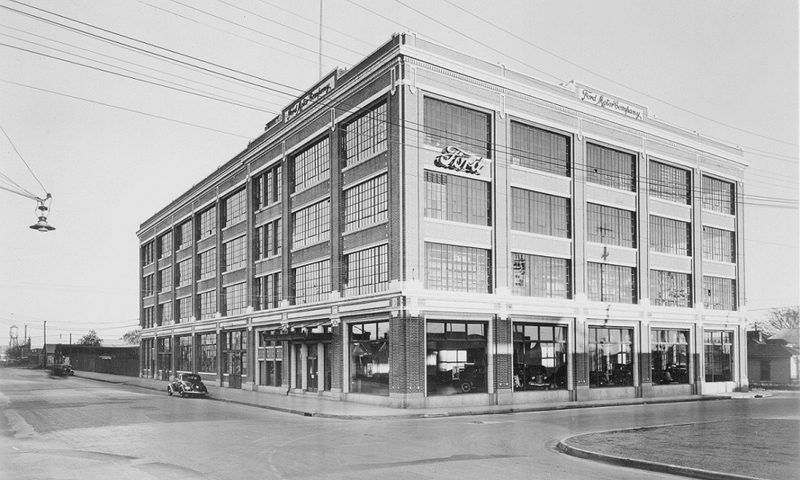 As the company expanded and took advantage of mass production and scale, Ford plants like this one in Dallas, Texas, pictured in 1936, sprouted up around the world. 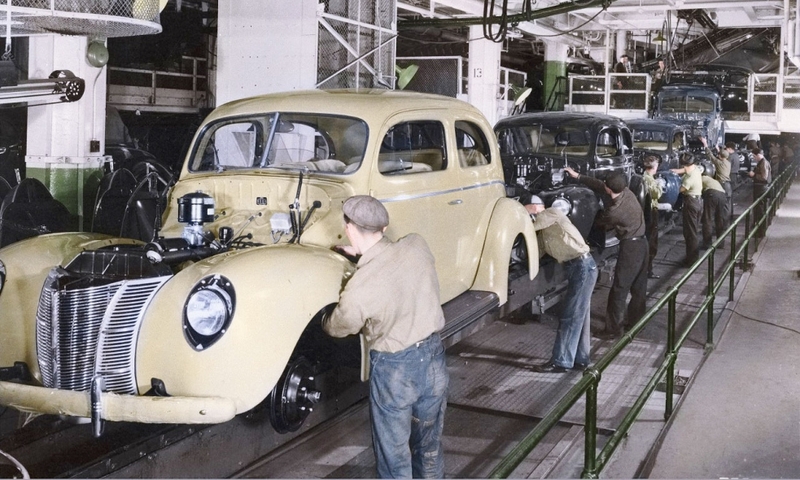 A Ford assembly line in 1940. 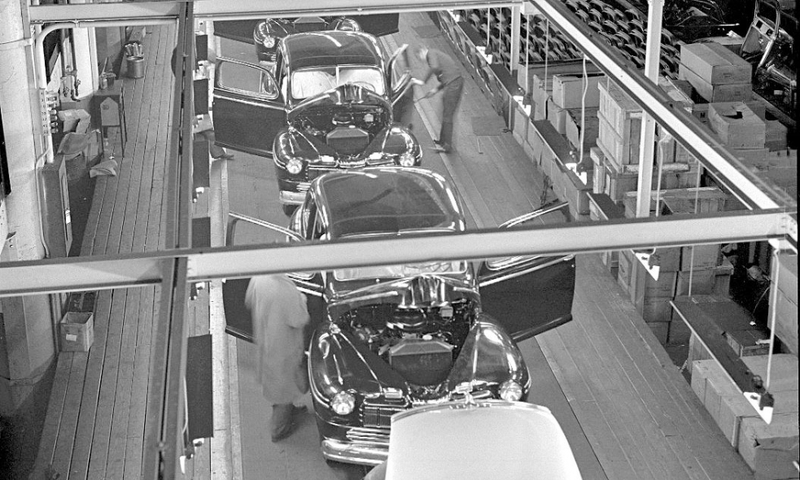 Body installation on a Ford assembly line in 1941. 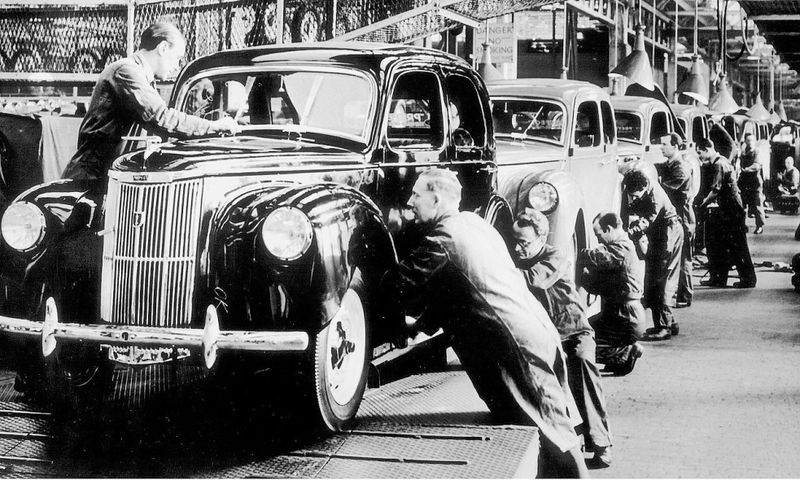 By then, car bodies had changed significantly, adding complexity to the manufacturing process compared to the early days of mass production. 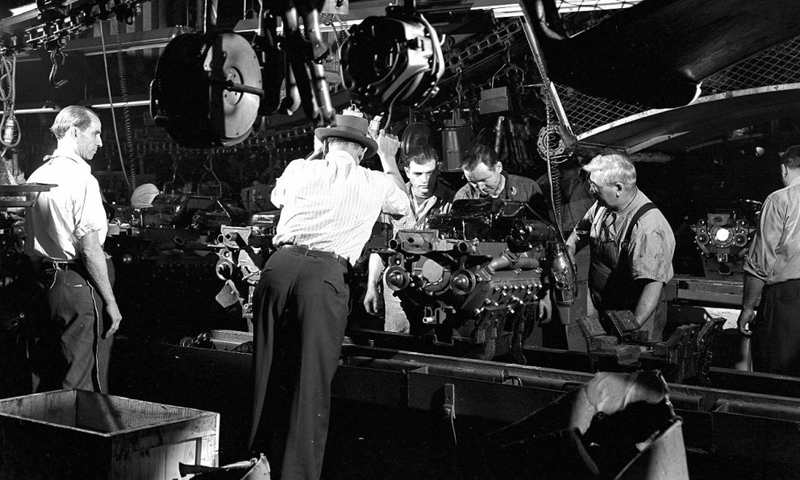 Ford engines mass produced in 1946. A row of Mercurys make their way down an assembly line in 1946. 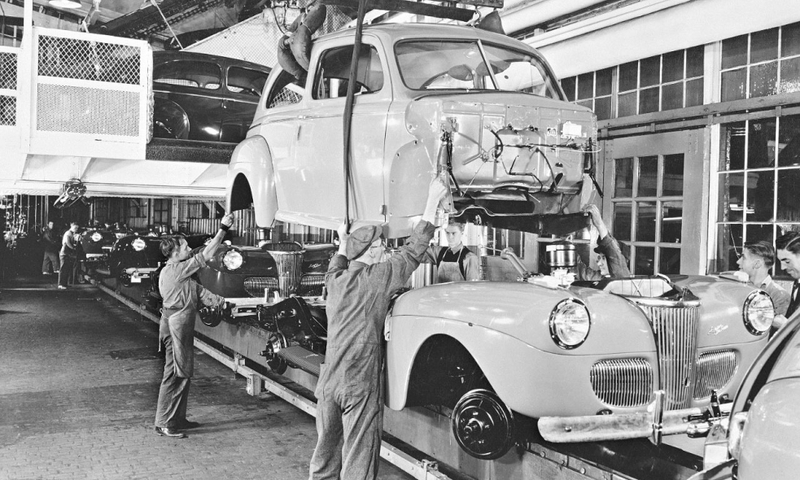 In the 1950s, the production line at Ford's plant in Dagenham, England, showed how labor intensive light-vehicle manufacturing remained. 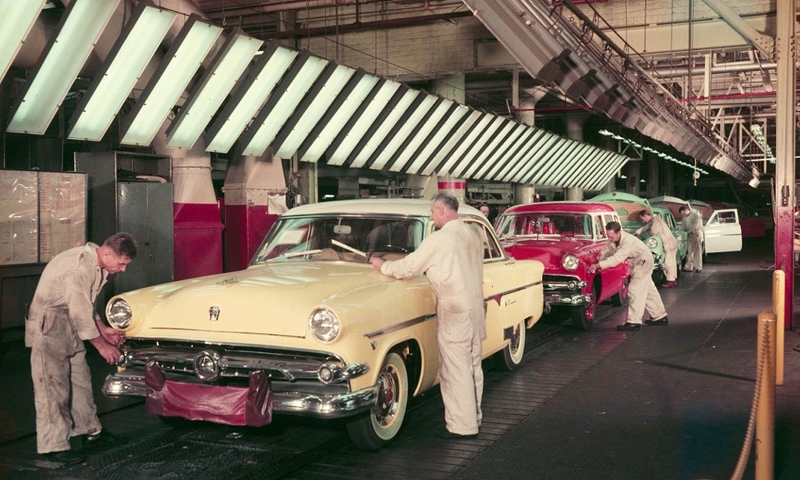 A Ford assembly plant in Dearborn, Mich., in 1954. 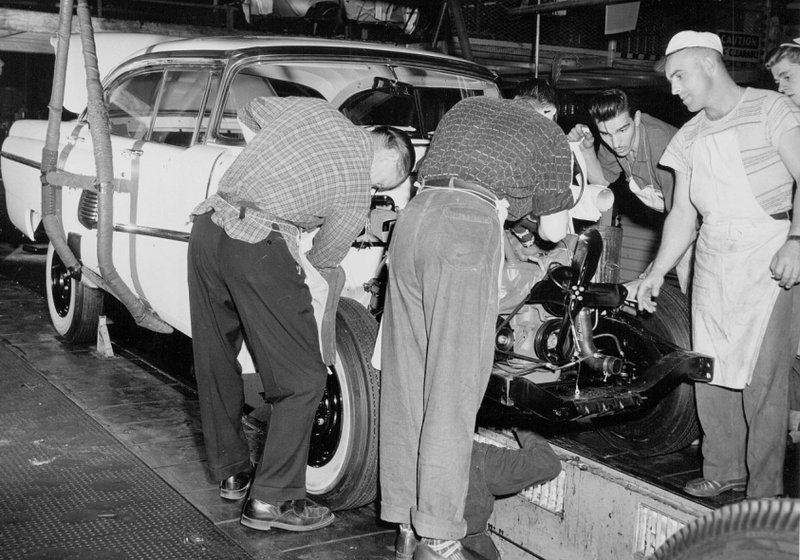 Before ergonomics became a buzz word, vehicle manufacturing required some workers to perform tasks from the pits, as seen in this 1956 image from Ford's Windsor, Ontario, assembly plant. 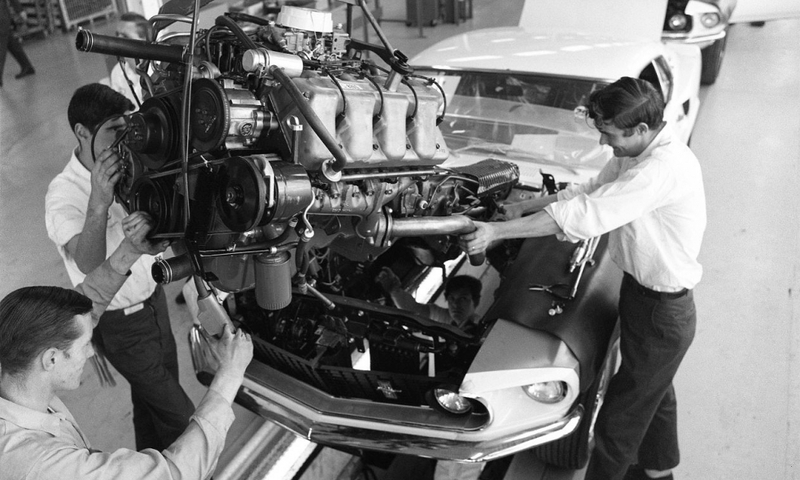 Dropping the engine into a Ford Boss 429 Mustang in 1969. 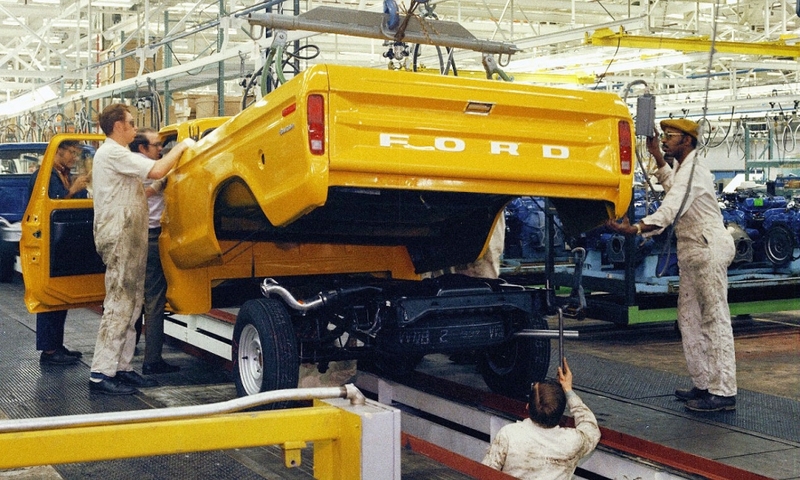 The bed is lowered onto the chassis of a Ford pickup truck at a plant in Louisville, Ky., in 1973. 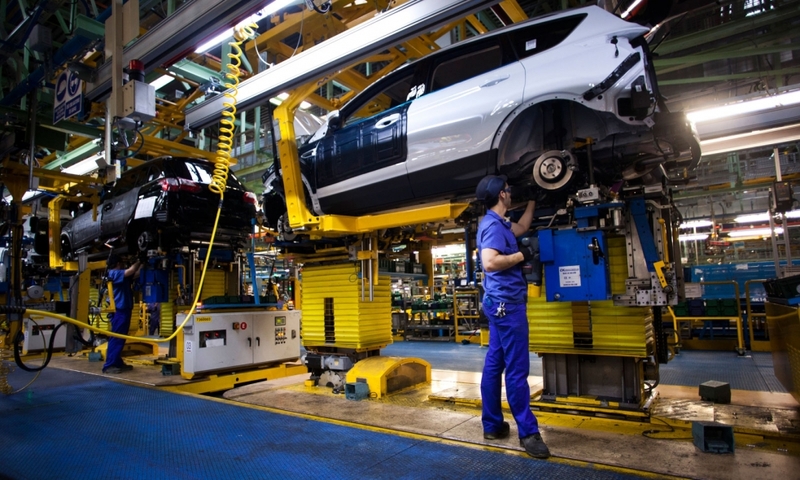 Attempts to adopt viable alternatives to the moving assembly line, particularly processes that aren't so numbingly repetitive for plant workers, have been elusive in the auto industry as well as other industries. 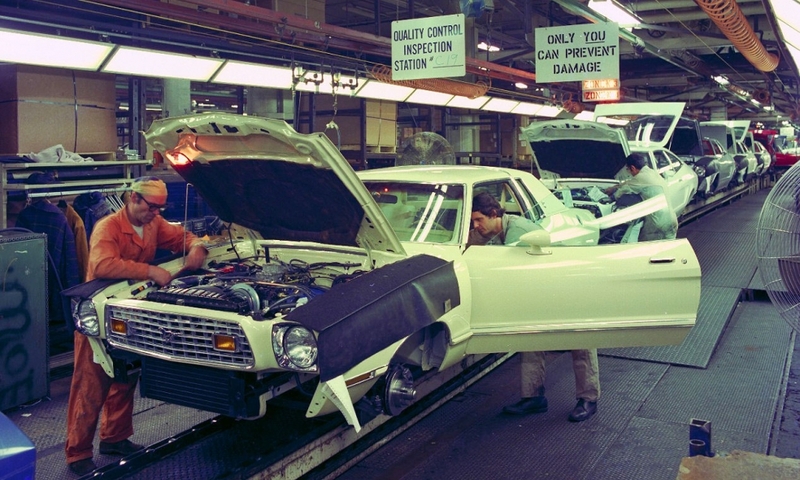 Mustang output at Ford's Dearborn, Mich., assembly plant in 1975. The 1970s were marked by the Arab Oil Embargo and rising Japanese imports, prompting Ford and its Detroit rivals to raise their game on the fuel economy and quality fronts. 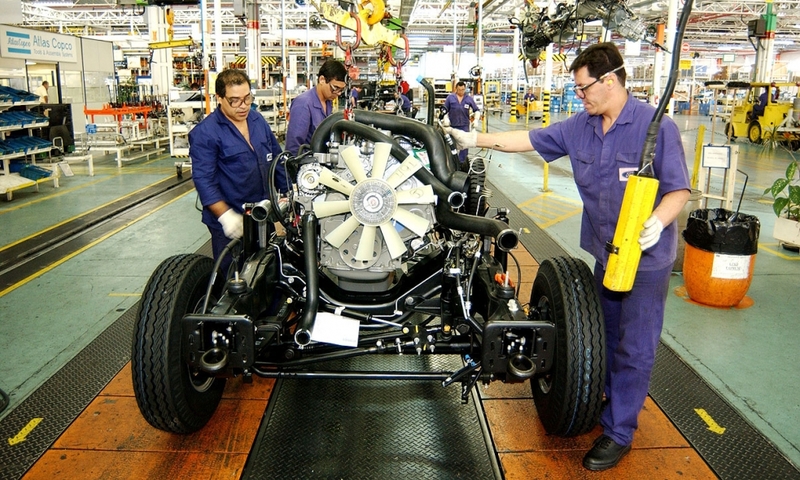 Workers at a Ford plant in Sao Bernardo do Campo near Sao Paulo in Brazil prepare a chassis with its motor mounted on the assembly line in 2004. A worker installs parts along the production line at the Ford car plant in Genk, Belgium, in 2007. 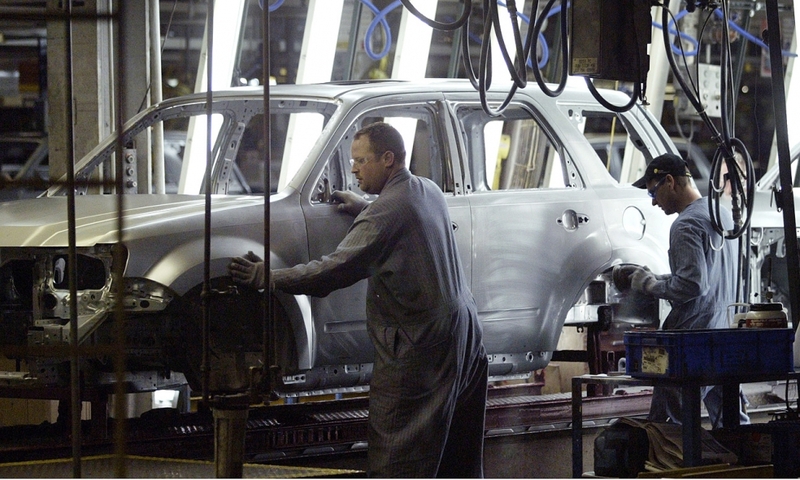 The factory will close by the end of 2014 as part of restructuring moves designed to restore Ford's profits in Europe. 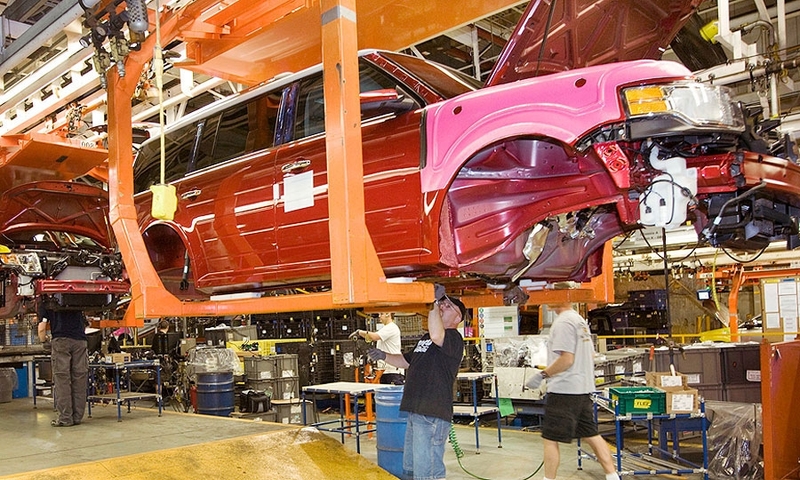 A new Flex crossover makes its way down the assembly line at Ford's factory in Oakville, Ontario, in June 2008. It was one of the company's first North American assembly plants to be converted to flexible manufacturing. 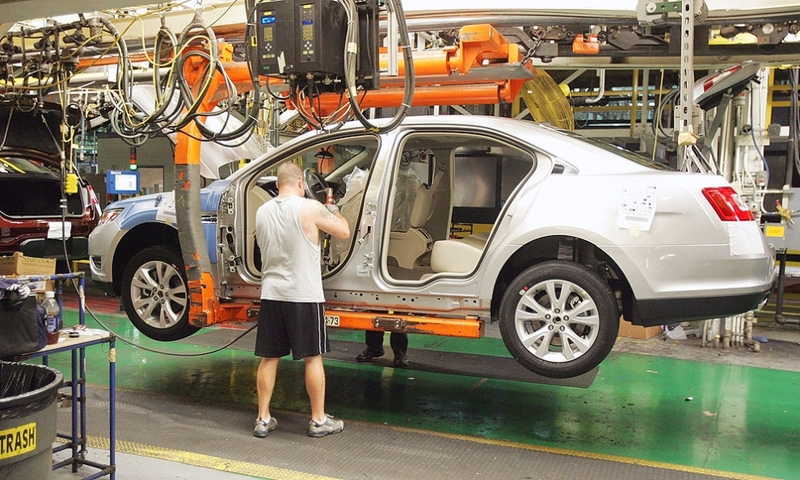 A 2010 Ford Taurus comes together at Ford's Chicago assembly plant in 2009. The Ford Escape on the production line at Ford's Kansas City assembly plant in Claycomo, Missouri, in 2007. 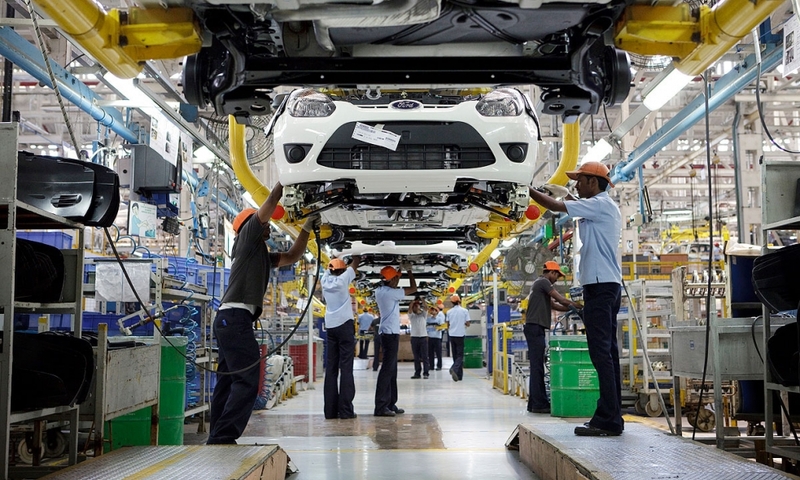 The final assembly line at Ford's factory in Chengalpattu, India, where the Figo hatchback, Fiesta sedan and Endeavor SUV are built. 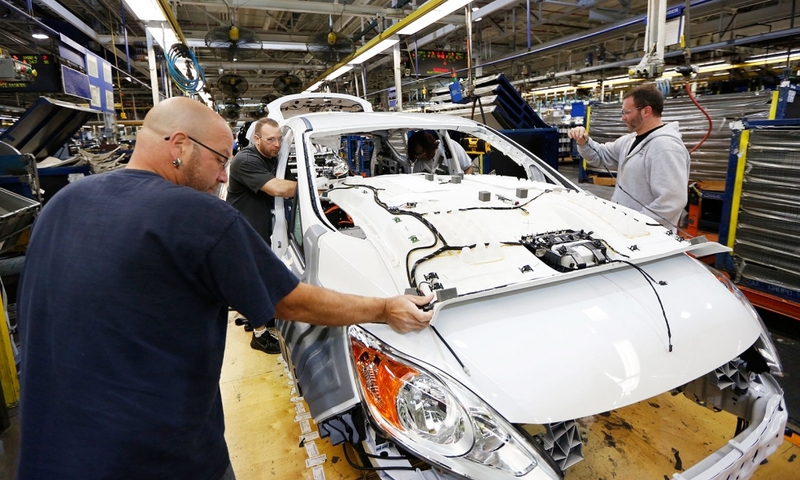 Ninety percent of Ford's global plants will run three shifts by 2017, which would boost production by 30 percent. A shock absorber suspension is installed on the chassis of a Kuga at Ford's plant in Almusafes, Spain, on Oct. 3, 2013. Ford is working toward a 2017 goal, when each of its factories worldwide will have the flexibility to produce four different models. The innovation is credited with greatly reducing the expense and time of manufacturing a car, which paved the way for mass output and marketing. 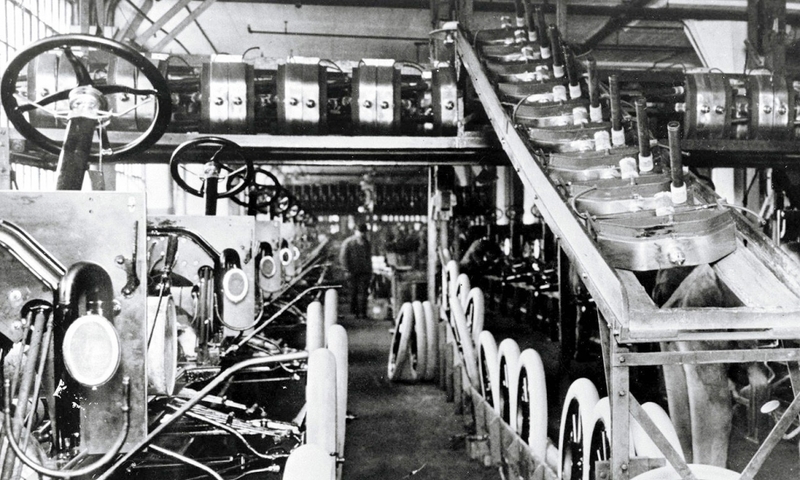 It was early 1914 before the plant was completely converted but it started a revolution that continues today.